Share your favorite funny horse names! 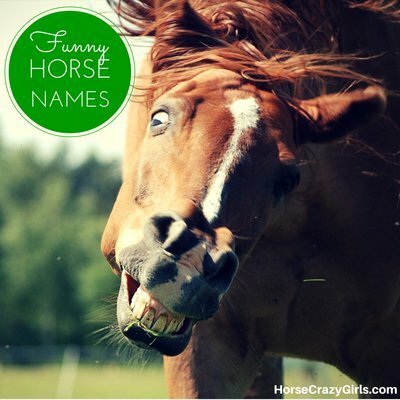 Here are favorite funny horse names shared by horsecrazy girls. Feel free to add your favorites! 2. My chestnut pony is called Wotzit cuz he is really orange looking - the same color as a wotsit! Next week my daughter's new large pony hunter is being shipped in, she's a pretty mahogany bay mare... have not thought up a name yet, but She is out of PiK Solo (Oldenberg stallion line) and Welsh. Here are some ideas, feel free to add your own. Those are some ideas.... I like the names Pik Pocket and Sheza Rockstar but you want something in her name to do with her dam and sire's name so maybe Sheza Rockstar Solo or Sheza Pikin Rockstar or something! HAVE FUN! I like this name because it reminds me of the movie "Two Bits and Pepper" but this name belongs to my friends little Arabian foal who has two white socks (aka) "boots" so when I made this name up (I was the one that named the foal) it just kind of stuck... so now, I love this name! Because it says "I have a wild side and I'm ready to prove it in less than 8 seconds." Plus it's just a fun name! Because it's a cool funny name, also my pony’s name! A funny horse name because it sounds like "Who Farted?" LOL! It's a funny name, if you don't want to be too serious. I love the name Jester! It's funny and cute! A chestnut draft cross named Ben "Big Ben"
A bay pony named Lenny "Little Lenny"
The name Unicycle to me is funny! I like the name Popcorn. I think a great horse name would be Magic Potion. but it's only a cute name. Do you like the name Hotdog? I'm not sure if I should name a horse that. So the announcer would announce riding "some horse" or riding "in the shower." He's named Optical Illusion because sometimes you see him and sometimes you don't. He's too fast and/or too tiny. He's a Shetland pony! We called her Pokey for short. I have a 15 yr old Arab x, bay, 14.2hh mare called Birdie. I thought it was a really weird name, but it kind of suits her now because she flees just like a bird! The funniest horse name i ever heard was Billy Joe Bob George. I almost bought the horse he was for sale but i didn't. The funniest name i have ever heard is called Bubble Bath! Snucook is the name of one of the horses at my barn. Love that pony! How you pronounce Guruda is (Gu-ru-da). So for a show name when the announcer calls out (your name) on Toppa Spaghetti so the horses name is just Toppa Spaghetti. Some names like Fluffy, Albert or Bert, Browny (for brown horses), Carlamelo (for Palomino horse), Whiskers etc. I think that would be a great name for a flea bitten horse! If I had a Shire horse gelding or stallion, I would call him Doggy! Especially if he is bay or black. I thought this was pony! It's only a little bit funny. A perfect name for a race horse! What would be really funny is if the equine that's named that is a small pony or is old and slow. My horse Maya's show name is Misty Chigger Van Dee.. Like what? Budweiser. I think it's a funny and cute name for a cherry bay stallion. His nickname could be Bud. Flip me a gold digger is my horse's name, I think it's really funny. Here are some names... hope you like 'em.